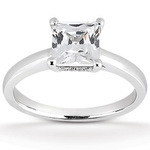 The diamond solitaire is the quintessential engagement ring. Elegant and sophisticated, the diamond takes center stage. Solitaire rings are synonymous with engagements—they’re what automatically come to mind for many of us when we imagine an engagement ring. 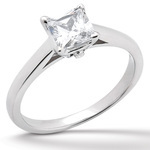 There’s a reason for the enduring popularity of solitaire rings. A single diamond set atop a metal band, solitaire rings evoke timeless beauty. They’re also versatile. 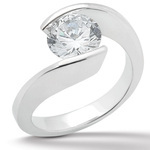 When paired with a simple band, a solitaire ring setting creates a sense of balance and harmony. 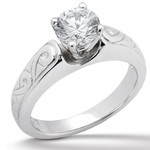 Bands featuring more intricate designs or more elaborate motifs, on the other hand, can offset the simplicity of a solitary stone. 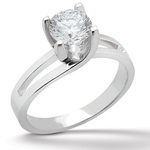 If you would rather not draw attention away from the diamond, an unadorned band may be a more fitting choice. When you select a diamond solitaire ring setting from The Diamond Vault, you can choose from a variety of classic diamond solitaire designs on our site, or opt for more modern styling. 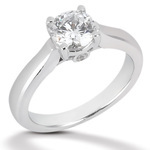 A bit of added detail on the band enhances visual interest, as seen on this solitaire ring. We handcraft our rings with your choice of white or yellow gold, palladium, or platinum. You’re not exactly sure what kind of ring she wants. The beauty of the solitaire is that it is timeless and classic—she can always dress up her engagement ring with a more intricately-designed wedding band. 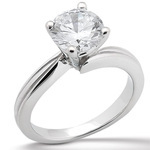 You want to emphasize and show off a single diamond. 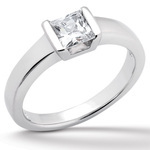 You’re looking for a ring that can be complemented with enhancer rings. 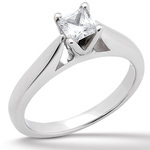 A solitaire is a beautiful and powerful statement of love and commitment. 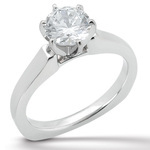 Wow her with the elegant simplicity of a beautiful solitaire engagement ring. Visit our Scottsdale store just outside of Phoenix, AZ to see our examples of solitaire rings first-hand or to speak with a representative. 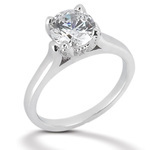 You can also browse our online catalog of solitaire rings. 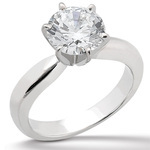 With a wide selection of high-quality, handcrafted engagement rings in a variety of designs and settings, it’s easy to choose the perfect symbol of your love.